Wizards are not into peaceful conflict resolution, at least not in games. You have a game with two or more wizards, you can be sure they’re going to set each other on fire, drop meteors or summon monsters to kill the other guy. Heroes is no exception to the rule. It has wizards, wizards fight. And you can do all of the things mentioned above and more to get to the other guy. Technically it’s the other guys, plural, but Heroes is really a dueling game at heart, so we’ll talk about that for now and get back to playing with more players at the end. There is no big plot about why the wizards fight, so we’ll just assume they meet on a road somewhere and none of them wanted to step aside and let the other pass. That generally seems to be enough to set them off, anyway. Like I said, they have issues with conflict resolution. These wizards have brought two tools to murder each other: Spells and Creatures, represented by different types of cards. Both Spells and Creatures belong to one of the four elements Earth, Fire, Air and Water. Love didn’t make the cut again and would have made the game weird, anyway. Spells are theoretically available for everyone, Creatures only fight for the Wizard specialized in their element. In game terms, that means the Spell deck is shared while each Wizard has their own Creature deck. From that deck they assemble their army during game setup. Which Creatures you pick here will have a big impact on your strategy, the two main options being a few big, nasty creatures or many cheap, squishy ones. Most creatures also have special abilities that you want to take into account when picking your army. The battlefield those army will meet on is formed by the players’ player boards, each with eight spaces arranged in two rows. Creatures in the back row are protected from attacks as long as there is another creature in front of them, so when setting up your army you’ll probably want your Wizard in the back and something big and beefy in front of him. With your armies on the field, and some starting spells acquired from the Spell Shop, the Wizards are ready to fight. If everything so far seemed familiar from other games of dueling wizards, this is where things change, because Heroes is a real time game. With the weapons of their choice – six dice per player – players roll as quickly as they can trying to assemble the symbols they need. Those symbols are the four elements – careful, water is almost white and air is purple for some reason – a Leadership helmet to command your creatures and a Card to draw and buy spells. 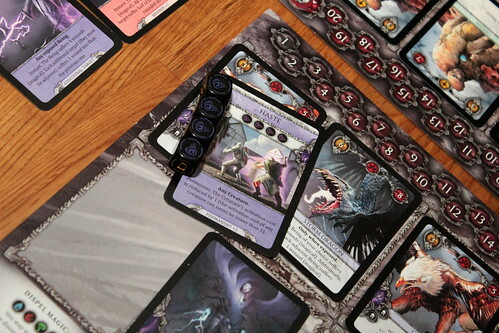 Players can take dice out and back in after every roll, rerolling whatever they like until one player yells Stop. Then rolling ceases and, starting with the player that stopped the game, players take actions based on their symbols. The stopping player has to take actions now and takes damage if it turns out he can not, the other players may take actions, but don’t have to. Three of those actions you can take are quick and simple. With three Card symbols on your dice, you can draw a card from your deck, plus one more for each additional Card symbol. This is the only way you’ll ever draw cards, so you’ll have to pick this option sooner or later. For five or six Card symbols, you can buy a new Spell card from the open display and add it to your hand. 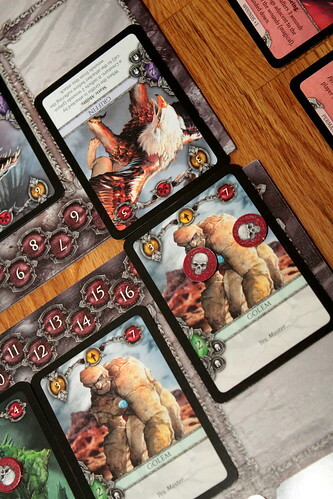 You start the game with five fixed spells in your deck, plus three you already picked from the display during setup. In some games, that’s all you want and you never buy fresh spells. In others you’ll find some good spells to buy later on, but generally shopping isn’t what you do the most. Third, you can use four different element symbols to dispel a permanent spell effect. There are all sorts of spells that stay around after you cast them, either helping you or hindering your opponent, and dispelling them is the only way to get rid of them again. Dispelling is a painful business since the player that stopped the game takes a point of damage for each symbol from the opposing element his dice show. Dispel takes one of each, so one point of damage is unavoidable – if you do it on your own turn, dispelling when another player stopped the game doesn’t hurt you. The trick is to have the right dice available at the right time. The last, more elaborate option to take an action is what you might call taking a proper turn. First you cast a Spell from your hand, then you activate Creatures of your army. Casting a Spell first is mandatory, though, which creates the basic tactical dilemma of Heroes: a Spell costs from three to five icons of its element, commanding a Creature costs from one to three Leadership icons. So you can’t cast a big Spell and command a big Creature on the same turn with only six dice, you always have to decide what option to try and roll for. This is the fun in selecting the Creatures to fight for you as well: if you only take the heavy hitters, you know you won’t be doing much with spells. On the other hand, if your army is made of weaklings you better get the right spells to pack a proper punch. That, fortunately, isn’t all that hard. A spell for three relevant icons is usually pretty weak. The Magic Missiles all players have in their starting deck do one lousy point of damage. Most of the 3-cost spells don’t do any damage at all, they support the Creatures you should have to do your work when you cast those small Spells. The earth spell Stone Skin, for instance, that reduces all physical damage taken by its target to one point until it’s dispelled, or the fire spell Wall of Fire that deals damage to anyone attacking your Creatures. On the other end of the power scale you get things like Fireball that, for five fire icons, deals three damage to its target and half that to everyone around it. Or Chain Lightning that deals four damage to its primary target and can be enhanced to jump to more targets, dealing damage to them as well. Enhancing Spells is nasty business, depending on the Spell you get different special effects. Permanent Spells become harder to dispel, Chain Lightning gains additional targets, most damage spells gain increased damage. A Spell from your own element gets one Enhancement for free, you may also discard two cards to enhance a spell. There is no limit to how much a spell can be enhanced, as long as you can discard the required cards. I’m still going to try, as an Earth Wizard, to buy spells up to 33 cards and then nuke my opponent from orbit with a single, enhanced 21 point damage Meteor. After your mandatory spell, you may spend Leadership icons to activate your Creatures. Moving one across the battlefield always costs one Leadership per space moved, making a creature attack or use its ability costs up to three, for the most powerful ones. Attacking with a creature is straightforward, you pick an enemy creature it can attack and deal damage to it according to your Creature’s Strength. If the accumulated damage is more than your target’s Health, it’s removed from the game. Most creatures have some restriction on where they can attack, only in their own column or only there and in the one to the right, for example. Only a few creatures can attack anywhere. Instead of attacking, you can activate creatures for their special abilities. They mostly work like spells and do things like damage in an area, heal the creature completely, enhance a permanent Spell already in play. They are useful, but generally less powerful than the Creature’s attack, so that’s another decision for you to make. Both creature heavy and spell heavy strategies have a good shot at winning when played right. Creatures do a lot of damage, but they can be killed. Spells are slower, but much harder to defend against. On the whole, the balance is there and it comes down to playing it right. That’s when playing with two players. With more than that, things change, and not for the better. The basic multiplayer game is a free for all deathmatch where you pick which player to affect with each of your actions. Dead players are eliminated, last player standing wins. That creates a pretty weird dynamic where you’re not sure who to attack and an eliminated player may have to wait for half an hour before the rest of the game is over. 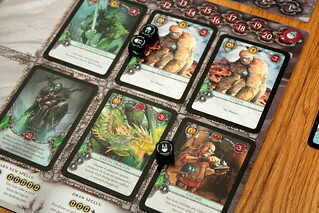 There is a rules variant that avoids player elimination by having players at zero health stunned instead of killed and determining the winner through victory points, but that creates a dynamic of piling onto the weakest player for points, because he won’t have any creatures left to defend him. Finally, there is a team variant that starts out as two separate one versus one games, but when one player is killed his partner has to take on the two opponents at once. You can guess how that mostly works out. So play Heroes with two players, be a happier player. In two players, I am sort of happy we tried it again after the introduction game. In the introduction, you can’t enhance your spell and you have a premade army, so you lose the fun of picking yoru Creatures and they might not work together with the Spells you pick at the start. The introduction is probably necessary to understand the game’s dynamic before you create your own army, but it was a slog to get through that. Do it once because you have to, then play the full game. That is, fortunately, a lot better. After you pick your starter spells you select monsters, and at this point you have to come up with a strategy that brings your Creatures and Spells together. The rest of the game you try to prove that your strategy works. When it does work, that’s quite satisfying, and the game does produce very tense endings where all your Creatures are dead and you repeatedly cast magic missiles to finish your opponent while he desperately draws cards to get his big damage spells back one more time. Tense. Good. But Heroes is not without its issues. For one, the whole deck-building aspect of the game is often ignored. Unless you’re going heavily into enhancing your spells, you rarely want to buy more spell cards. It’s much better to have a few good ones and draw them often than to have a big library. Much worse, and really my main problem with Heroes, is its lack of interaction. Okay, I take his health away and kill his creatures, but I don’t actually care what he is doing. It’s a real time dueling game, and most of the time I don’t care at all what my opponent is doing. I might wait for him to stop the game when I want to dispel something without taking damage, but other than that there’s nothing I can do about his dice, nothing I can do about his hand, nothing I can do about his deck, so I really have no reason to watch him. I just roll my dice trying to get my symbols. This game could have been so much more if there were ways to change the way your opponent plays the game. Like a spell that forces him to reroll all his dice. When you see him assembling dice for a big spell, you stop the game first and cast your cheap interrupt to have him start over. A spell that destroys the top card of his deck would also make buying spells more relevant. An expensive spell that lets you counter a spell your opponent cast on you, so when he knows you have that spell he has to pay attention if you have the resources to cast it. Anything that makes me pay attention to what the other player is doing right now would make the game so much more tense and so much more like I imagine a wizard duel should be. But I just roll on my own, assemble my dice and hope I get there before my opponent does. A duel of very shy wizards that won’t look at each other while fighting. Heroes is a nice enough, good-looking dueling game, but it falls short of what it could have been.